Eric Nylund is a New York Times bestselling and World Fantasy Award nominated author of fifteen novels including HALO: THE FALL OF REACH and THE ENCHANTED KNOT that have sold over two and a half million copies. For 15 years, Nylund’s day job was making video games. He attended the 1994 Clarion West Writer’s Workshop and has a Bachelor’s degree in chemistry and a Master’s degree in theoretical chemical physics. He lives in the Pacific Northwest with his family on a rain-drenched mountain. Click here for more stories by Eric Nylund. 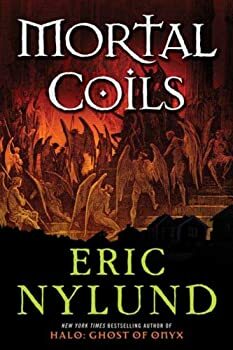 Eric Nylund’s new novel Mortal Coils is a young adult urban fantasy which is lacking in werewolves and vampires. Thus, Mortal Coils is a wonderful entry into this genre and it doesn’t have to fall back on all things cliché. Eliot and Fiona Post are twins being raised by a strict controlling grandmother in a small town in Northern California. They don’t get to do any of the normal things that their peers get to do. Their education is non-typical and excellent, but they are forced to live by a constantly growing list of rules that prohibit fun, imagination, and music. Jack Potter — (1998-1999) Publisher: Jack Potter puts computer cryptography to work for the highest bidder: sometimes for private corporations, sometimes for the government. Sometimes the work is legal; if not, Jack simply raises his price. But one day, Jack discovers something cloaked in the hiss of background radiation streaming past the Earth from deep space: a message from an alien civilization. One that’s eager to do business with humanity — and its representative. Before he knows it, Jack has entered into a partnership that will open a Pandora’s Box of potential profit and loss. The governments, the multinationals, and mysterious players more powerful still, all want a piece of the action — and they’re willing to kill, even wage war, to get it. Now Jack is entangled shifting web of deceit and intrigue in which no one, not even his closest friends, can be trusted. For Earth’s cloak-and-dagger business practices are writ large in the heavens… and hostile takeovers are just as common across light years as they are across boardroom tables. Resisters — (2011-2013) Ages 9-12. Publisher: In the tradition of Robert Heinlein and Ray Bradbury, million-copy bestselling Halo author and game developer Eric Nylund brings action-packed science fiction to a young audience with this riveting children’s debut. Twelve-year-old Ethan Blackwood has always known exactly what he wanted — to win the state soccer championship, get into the best high school, and become an astronaut. Then he meets Madison and Felix, who tell him something… insane. They claim that 50 years ago, aliens took over the earth, and everyone past puberty is under their mind control. Ethan doesn’t believe it. But then he sees for himself the aliens’ monster bug robots and the incredible way that Madison and Felix have learned to fight them. So Ethan Blackwood has a choice: he can go back to his normal, suburban, protected lie of a life — or he can become a Resister. This is science fiction on the lines of Scott Westerfield and Cory Doctorow for middle graders. Pawn’s Dream — (1995) Publisher: A nightman at a 24-hour quickstop grocery, Roland Pritchard escapes the tedium of his life by entering into a fantasy world consisting of demons, war and miraculous adventure. But in an extraordinary merging of nightmare and daydream, he discovers that the two worlds are equally real, and deadly. A Game of Universe — (1997) Publisher: Erybus, head of the Morning Star Cartel, sold his soul 1700 years ago. Now the contract is due and Erybus must pay. But an option allows him to contract some of his debt to 13 champions, one of whom must find the Holy Grail. Erybus will make him rich beyond measure, but only one can win. Dry Water — (1997) Publisher: A painfully shy writer travels to the sleepy town of Dry Water to try to get his career back on track. However, he is soon besieged by some of the town’s more unconventional denizens — including a witch and assorted ghosts — who believe he is a prophet who has come to reveal the source of the mystical, magical spring that gave the town its name.